Rogers Corporation manufactures PORON microcellular urethane foams for the communications, automotive and electronics industries and other manufacturers of industrial equipment and devices. If you are in need of a resource for PORON gaskets fabrication, look no further than SRP. Being a Preferred Convertor for Rogers, we are a company who can help you with your PORON gasket needs and beyond. Our capabilities allow us to work with our customers from the design stage, to material sampling, product prototyping, through manufacturing and beyond. 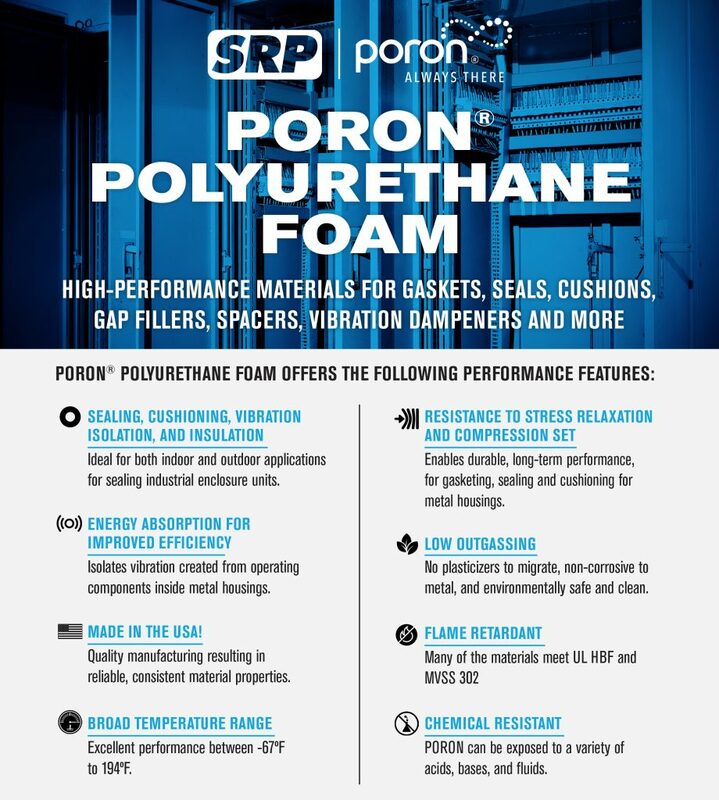 We have extensive material data sheets detailing PORON foams that SRP has to offer, and would be pleased to talk to you about your specific needs. Please do not hesitate to contact us with questions. SRP stocks material samples from the entire PORON line of materials. We would be more than happy to send your company a sample today. Our PORON gasket products are used in a number of industries for a variety of purposes related to gasketing, sealing, and cushioning. Why Choose SRP as Your PORON Gaskets Resource? Contact us for your non-metallic custom fabrication and die-cutting needs. SRP has been in business since 1951 and we have a reputation for excellent customer service and unsurpassed quality. In addition to PORON2 gaskets, you can find out about our other products, including: neoprene gaskets, silicone rubber gaskets, EMI gaskets, thermal gaskets, and the list goes on. We serve a number of industries, including: appliance, electronics, aerospace, automotive, telecommunications, and many more.